There’s just one problem with the townsfolk of Black Spring: they’re hexed. The people of Black Spring live normal lives; they work jobs, go to school, and come home to dinner with their families. There’s just one problem: the people of Black Spring are hexed. You see back in the 17th century, a townswoman named Katherine van Wyler was accused of witchcraft. It was believed that she had brought her young son back from the dead, and in classic puritanical fashion she was dispatched to hell. Except, she didn’t go there. Instead, Katherine continued to wander the city, muttering curses for all who would listen. Well, the good townsfolk couldn’t have that, so they sewed her eyes and mouth shut. To this day she shuffles through the city, whispering death out of the corner of her mouth to anyone who gets close enough to listen. Four centuries later, this is the town we are dropped into in Thomas Olde Heuvelt’s Hex. The world has changed since Katherine first began her spectral walk. People no longer believe in the supernatural world, which is why the town residents are committed to keeping the Black Spring witch a secret. If the larger world finds out that there is a real witch haunted their town, some busy-body scientist will inevitably try to open her eyes–and then all hell will break loose, or so they believe. Legend has it that Katherine’s evil eye will bring death to them all. So they do what they can, keeping watch over Katherine’s activity with a high tech surveillance system and a whole team devoted to erasing her from prying eyes. Structures are constructed to hide her when she stands for hours in the middle of the road, and families give her wide berth when she visits them in their homes. But why do they stay, you may ask. Well, it turns out that Katherine’s hex extends well beyond the edges of Black Spring. In fact, if a resident leaves the town for too long, they are overcome with the desire to commit suicide. So they stay and hide the witch the best they can. That is until a group of teenagers begin to run a series of tests on Katherine. How much interference can the she take before she retaliates? Sadly, they find out. As a proud skeptic, supernatural stories rarely send a tingle down my spine. Witches, ghosts, and monsters are fun, but it’s people who have the ability to scare me. And yet, Heuvelt blends the supernatural and the natural in a way that sent me to bed shivering. I was often reminded of 2012’s A Cabin in the Woods. Although the two stories are distinct, they both wind realistic problem-solving into an otherwise supernatural plot. This commitment to reality reeled me in even as it escalated in absurdity. The town’s decision to devote a security team to monitoring Katherine’s activities via cameras lends the premise a verisimilitude that grounds the more fanciful aspects of the tale. How else would a modern town keep tabs on a supernatural being? This juxtaposition of an ancient, evil creature and modern technology works shockingly well. 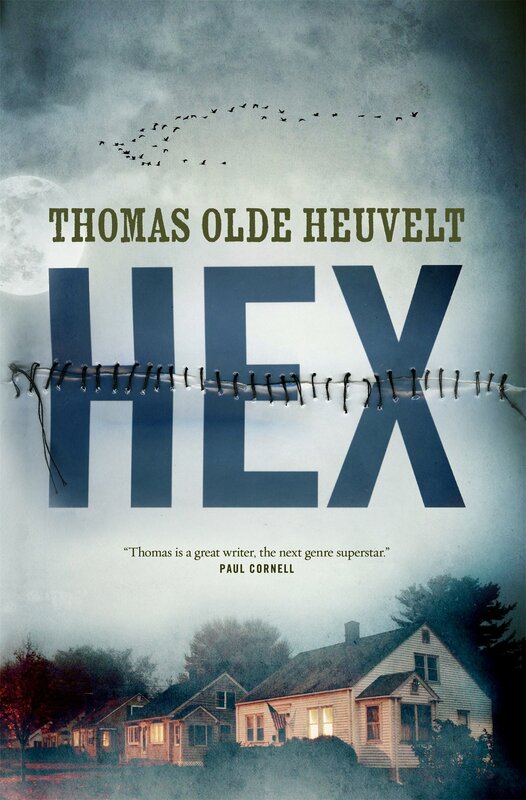 Heuvelt’s imagery contributes heavily to the terror in Hex. An overall feeling of dread seeps out of every page. Black Spring is a grey, cold place surrounded by black woods. Even without dialogue, I could feel the desolation creeping through the picturesque mountain town. It doesn’t stop there. It is the descriptions of Katherine and her influence on the town that seals in the terror. Heuvelt is intentional with his descriptions. He keeps the scenes from being bogged down by focusing on the details. The texture of the thread that keeps Katherine’s eyes shut, the grey of her skin in the moonlight as she stands in the rain, even the color of her breast when it is exposed during the teenage gang’s “experiments” all leave the reader with the tang of terror in their mouths. Another success in this story comes in its character diversity (although don’t expect much gender diversity; this is a boys club). It was a joy to move between the controlled point of view of the head of the security team to the superstitious butcher’s wife–to listen as a father explains the hex to his son, then watch what the son is up to in his room. These vastly different perspectives allow the reader the space to piece together a more objective view of the situation. Each character has a distinct and interesting point of view, and somewhere between the opinions the reality takes hold: the town is doomed. A certain amount of death and destruction is expected in any horror story, but this violence packs a punch. Although sparse, the brutality is unforgiving and sticks with the reader long after the story’s end. Adults, children, even animals are all potential victims of Katherine’s wrath. This would be terrifying enough, but Heuvelt adds an element of cruelty that is so unexpected and yet true-to-life that it can take your breath away. It’s worth mentioning that this book was set in a Dutch town in its original language and was moved to the America for its English translation. The Hudson Valley works well for this story, but I never quite shook the feeling that it should have retained its original location. Changing the location didn’t add anything meaningful to the story. Hex is wonderfully spooky book filled with horrific imagery and twists that will keep both newcomers and veterans of the genre entertained. This is the perfect book to curl up with on a fall night. Thanks for the re owe. I was really curious about this book, but reluctant to put the time in to read it, and had no idea what to expect from it, although the first chapter seemed scary enuff. I checked it out from my library and returned it before finishing. I think I’m gonna check it again, and actually finish this time.